The January Meeting has been cancelled due to inclement weather. Jim would like to try and come and do a program for us at a later time. Jim Kerr has been fly fishing, river fishing, saltwater fishing, a fishing guide, and working on the water his entire life. He has fly fished extensively in the Northeast Saltwater for striped bass and blue fish, in the Florida Keys and Everglades for snook, bone fish, tarpon, and red fish, and for salmon, steelhead and trout in the American West. 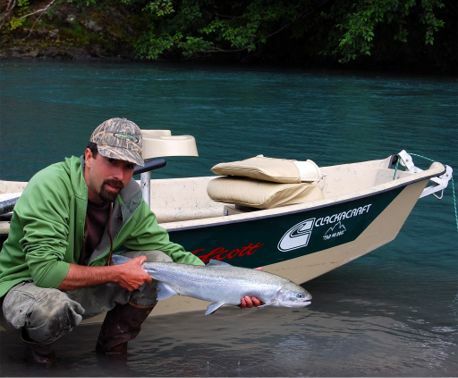 He now resides on Washington's Olympic Peninsula where he is a full time fishing guide for steelhead, trout, and salmon. His guide service has been featured in "Northwest Fly Fishing," "Western Outdoors" and "Fly Fishing and Tying Journal" magazines as well Doug Rose's new book on fly fishing for winter steelhead, "The Color of Winter." He can also be seen from time to time on The Outdoor Network, and Northwest Outdoors TV, as a fishing guide for anglers such as Skip Morris, and doing fly tying demonstrations of his original fly patterns. "Every trip I fish is different but my goals are always the same. Catch fish, have fun, relax, and enjoy pristine, natural, uncrowded surroundings. If there is something in particular you want to learn about, let me know. Maybe good beaches for sea-runs, how to cast farther, good presentations for winter steelhead, or hatch timing for Peninsula streams. (If you want me to just shut up and row the damn boat, I can do that too.) I believe that fly-fishing is, at its best, a vehicle for understanding the interconnectedness of natural systems. Trout fishermen must understand the life cycles of insects if they want to capitalize on every streamside opportunity. Winter Steelhead anglers study the drainages they fish to help them predict ever changing water levels and clarity. When we venture out of the rivers and into the salt we realize that we have to follow the movements of baitfish, which are influenced by tides, currents, moon phases and the availability of there prey, plankton, euphasids, barnacle spawn...And on it goes. Like every great pursuit each hard won answer brings a sense of accomplishment, and reveals a thousand new questions." Good fly-fishing can be a complicated and endless study, or a few hours to forget the rest of the world and loose yourself on a great stretch of river. Thank you for visiting my web site, if you have any questions or comments, or would like to go fishing, please feel free to call me (360) 301-4559 or email me.